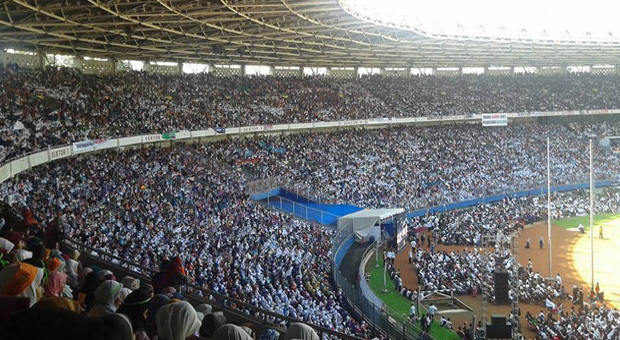 TEMPO.CO, Bandung – The Hizbut Tahrir Indonesia (HTI) is planning on sending 500,000 of its members from West Java, Banten, and Jakarta to the Gelora Bung Karno in Jakarta on Sunday, June 2. “HTI will urge the government to replace the current governmental system to a khilafah system,” said West Java HTI spokesman Luthfi Afandi, Thursday, May 30. Luthfi explained that a khilafah system is an Islamic administration system which applies full Islamic sharia and missionary. Such administration had been applied in Saudi Arabia for 1,300 years. HTI believes that the application of Islamic sharia will bring prosperity to the country. Around 130,000 Muslims have attended the biggest Khilafah conference in Islamic history in Bung Karno stadium in Jakarta, Indonesia. Hizb ut-Tahrir held the conference titled “Big change of the World towards Khilafah”. Prior to this, 30 regional conferences were organized by HT Indonesia in various stages during the month of Rajab. The conference included speakers and participants from around the globe including Australia, Lebanon, Europe, Sudan, Egypt, Pakistan and elsewhere. The main message of the conference was that the world is experiencing a great and imminent transition towards the Islamic Khilafah. This theme allowed for a number of topics to be addressed and some exploration of issues such as secular liberalism, democracy, capitalism, and then subsequently looking at the Khilafah as an alternative solution.
. . . About 300 members of the pan-Islamic movement Hizbut Tahrir Indonesia rallied Wednesday morning in front of the consulate in Medan, the capital of North Sumatra province. Later, about 50 Muslim students protested, marking the third straight day of demonstrations there. Both groups called on Washington to punish the makers of the film, “Innocence of Muslims,” which denigrates the Prophet Muhammad. . . Here are photographs from the International Ulama Conference organised by Hizb ut-Tahrir Indonesia on 28 Rajab 1430AH / 21st July 2009.